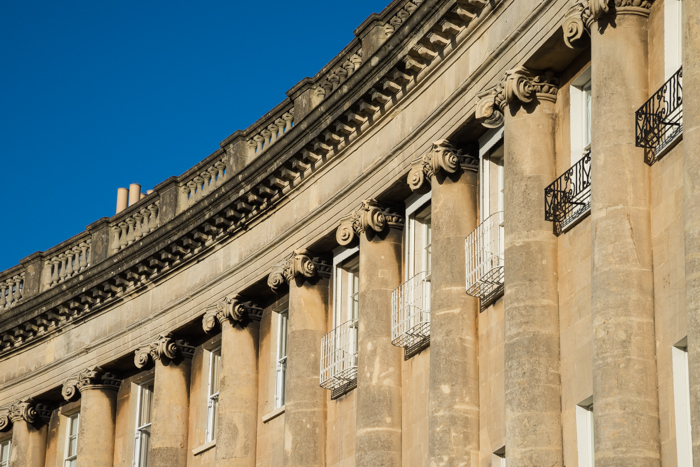 So, I took myself off to do an architectural shoot in Bath. I’d been promising myself that for some time – you can’t really be an architectural photographer in Somerset and ignore Bath. However, it’s hard not to take the photos everyone expects you to take in such a place. Naturally, the Circus and the Royal Crescent feature prominently. It’s also hard to take a bad photograph; such are the photogenic qualities of the place. But then, sometimes clichés are clichés for a good reason: a beautiful shot is something that just can’t be resisted. It may be great to be too cool to pay attention to obvious, but even for someone like myself, kitted out with a fair degree of cynicism, stumbling upon Thomas Gainsborough’s house was still a thrill. There’s something about touching history so directly like that. Having said that, I did what I usually do, and got round some of the back streets to see if there was something more challenging to shoot there. I’m still sifting through the numerous photos I took that day and haven’t yet decided if some of those less obvious shots are worth showing on this site. I have, however, published one on my Fine Art website. That site is mostly concerned with my painting (see www.stephenrileyart.com), though some photographs show up on there. They are, however, usually experimental, uncommercial and very much unlike the work I show on this site. The fact that some self-appointed critic remarked "that’s not art", when I linked that pic to social media, is indicative of its qualities, though when I am met with remarks like that, I tend to see them as unintended compliments, as they mean I have presented something different and something that abrades the comfortable. Paraphrasing a proper critic, Clement Greenberg: "all original art is ugly at first". On a technical level: this wasn’t long before Christmas (2016). Although there is strong light and the sky is vivid blue, it was a wintry sun that was low in the sky, and that came with positives and negatives. On the one hand, the bright raking light threw up dramatic contrasts on the buildings’ facades; on the other, the contrasts were sometimes so extreme it was difficult for the camera to cope. Ideally, I would have had a tripod, recorded multiple images and processed the outcomes using HDR (High Dynamic Range) techniques. However, I didn’t, and I sometimes prefer, in any case, a more direct form of photography. So often it is the case that when one photographs a thing many times, it remains the first shot that has the best composition. Plus, when shooting RAW, it is usually possible to balance-out the images in Lightroom.